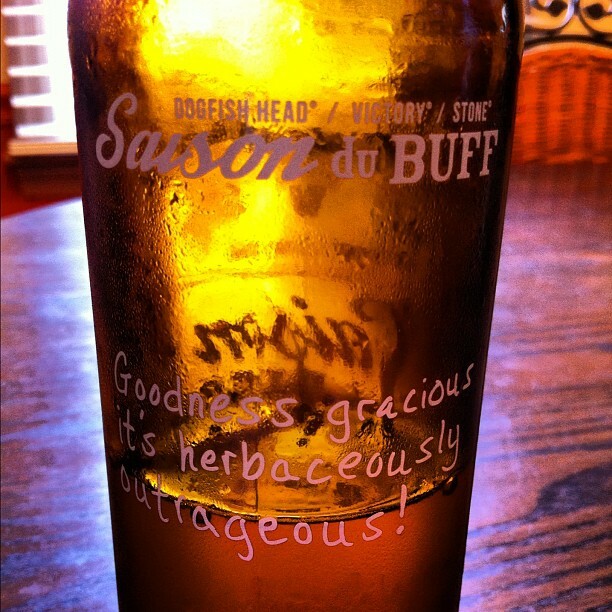 In my last review, I took a look at Victory’s version of this collaborative effort, their Saison du Buff. 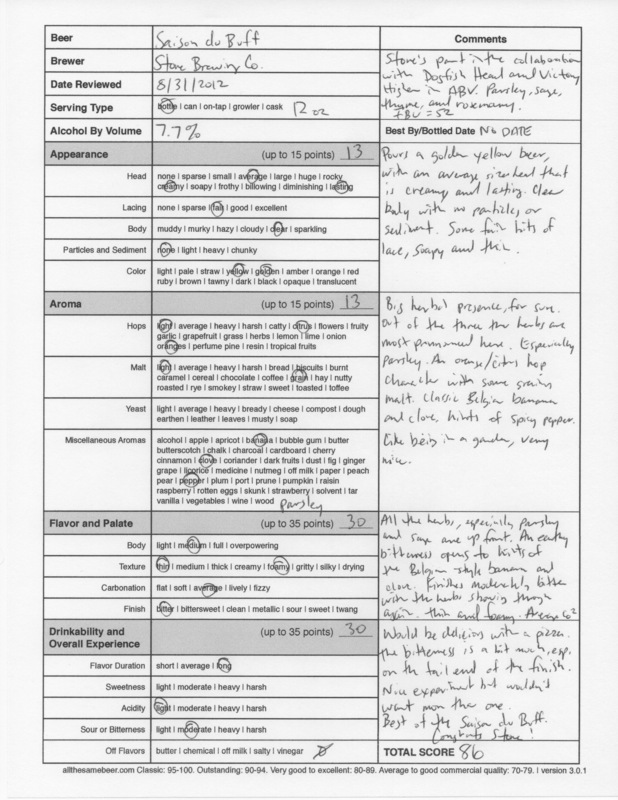 I scored it 83 points; several months ago, I reviewed the Dogfish Head end of the effort, putting it at 84 points. Today, we’re looking at the last part of the triangle, Stone Brewing Company’s Saison du Buff. The idea behind Saison du Buff, a Belgian-style farmhouse ale, came about in 2003 when the founders of Dogfish Head (Milton, Delaware), Victory Brewing Company (Downington, Pennsylvania), and Stone Brewing Co. (Escondido, California) all came together to form B.U.F.F. — Brewers United for Freedom of Flavor. 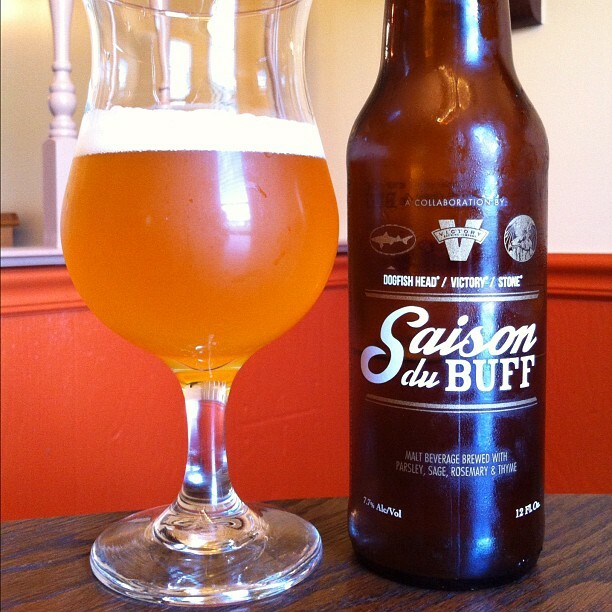 They quickly took a hiatus, but in 2010, things became very active and the first batch of Saison du Buff was produced. The beer is brewed with fresh parsley, sage, rosemary, and lemon thyme, and in 2012, it’s all fresh from Stone Farms, which is Stone’s organic gardening arm. The Stone version is different in the fact that it is higher alcohol than the other two, coming in at 7.7% ABV (alcohol by volume) rather than 6.8%. The IBUs (International Bitterness Units) are 52, and this beer is hopped with Centennial and Citra, while the malts used are Pale Malt, Pilsner Malt, Wheat Malt, and Flaked Rye. The pour went very much like the other two versions of this beer, producing a golden yellow drink with an average size head, creamy and lasting. The brew was clear and free of particles and sediment, and the lacing was fair, leaving behind soap suds on my glass. On the nose, all the herbs are present and accounted for, especially the parsley. It’s very much like being in a garden, which is quite nice; then, there’s a slight orange hop hit, and a definite Belgian-style character with banana and clove. There’s also a touch of spicy pepper. The taste gives you equal hits of parsley and sage, and opens with an earthy bitterness that is sharp and at once floral as well. A strange but interesting flavor — which leads to a middle with hints of the classic Belgian Saison fare: banana, clove, and a touch of peppery spice. The finish cleanses the palate with a moderate bitterness and rides out the herbal, on your knees, in the garden-like flavor. Mouthfeel here was fairly thin and foamy, and the carbonation was average. While Stone’s was of higher alcohol than the other beers, you couldn’t tell it. Once again, I maintain what I said when I reviewed the Dogfish variety of Saison du Buff: This would be an excellent beer to pair with a delicious pizza. I did think that the Stone brew was the best of the three, although the bitterness was nearly overwhelming and degraded the excellent flavors provided by the herbs. I love what this beer stands for and the experimental aspect to it, but personally, I’m drinking one of these and I’m moving on. It’s good, but not outstanding. Stone Saison du Buff, 86 points. Price: $3.99 US for one twelve ounce bottle. 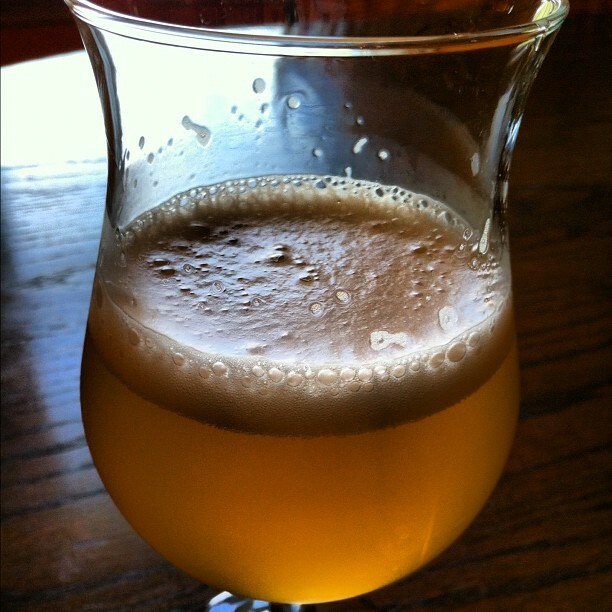 Tags: 86 points, beer, beer review, saison du buff, stone brewing co.